SPAIN—Despite the difficulties of being able to meet and organize this May Day, we were able to arrive and distribute more than 500 leaflets and 200 Red Flags. The working class already identifies us as “Red Flag” and gladly received the newspaper. A retired worker observed us and asked for a copy of Red Flag. “It is interesting to know that there are still young people who read and share this kind of literature,” she said. We invited her to stay in contact so we could give her the paper and discuss it. We also gave her our email. “Keep up your good work so we can destroy capitalism,” were her farewell words. We answered that racism is the perfect tool to divide the working class and that our objective is not to confront those of our same class but to unite our class. 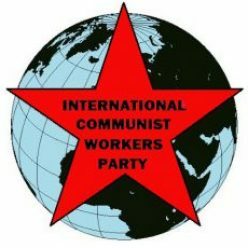 We told him that we believe that an international party can be built and that in fact that party is called the International Communist Workers’ Party. We explained that we don’t depend on any NGO and/or other aid from the system, that we are normal workers who only want a better future for the new generations. That future is communism. 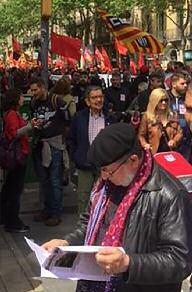 Thousands of workers came out to march like every year shouting slogans against capitalism. We fulfilled our goal of again taking Red Flag to the streets and we feel more optimistic about moving forward in building the International Communist Workers’ Party. We will continue spreading communist ideas for building Communism all over the world. Long Live May Day! Long Live Communism! Long Live ICWP!